Phil Mooney has been the historian and archivist for The Coca-Cola Company for three decades. Recently, we spoke with Mooney about Coca-Cola collectibles, the artists who created many of Coke’s most famous images, and some of the rarest pieces he’s ever seen. Mooney writes a blog called Coca-Cola Conversations, which is a member of our Hall of Fame. As the archivist for Coca-Cola, I’m interested in preserving the history of this company. Integrally tied to that history are all of the things that we’ve used to market and promote the products. That’s really how I got exposed to the collecting side of the business: I learned that there are all these people out there who were just collecting Coke stuff, things that we produced to advertise and market the product. People were actually bringing these pieces into their homes, setting up rec rooms, decorating with them, and actively buying and selling things on sites like eBay. Even though we have a large collection of advertising and marketing materials, there are people out there who have things we don’t have in our own collection. I will often go to the national collectors meetings, just to get a sense of what people are doing. There is also a regional meeting here in Atlanta in the springtime, which is probably the second-largest collectors meeting of the year. If I’m just traveling somewhere and I know that there’s a collector, I may reach out to them and go for a visit, but I’m not actively moving around the country, looking at people’s collections. You tend to find out about these naturally, and people will sometimes send me pictures of their collections and things of that nature. So you get to learn and know who’s out there. Coke collecting is really fascinating because there are so many elements to it. When I was in Denver recently, I ran into this one gentleman who only collected small things. He had this incredible collection of pens and pencils primarily. I never realized there were so many variations in pens and pencils. And this man had several hundred different examples of pens and pencils that the company, or one of our bottlers, had produced over the last century. There were mechanical pencils, regular pencils, pencils that had strong graphics attached to them, left-handed pencils. There was such a thing—the logo is turned just the opposite way from all of the others. That’s the great thing about collecting: You can have this niche and collect in a given category and become an expert in that category. This man knows much more about pens and pencils than I will ever know, most likely. He was telling me about all the variations and why this one was more collectible than that one. It was absolutely fascinating. I never would’ve figured that out. There are other people who only collect bottles or cans or certain types of bottles or certain types of cans. Everybody has a specialty that they’re into. And that’s what makes it fun; you can specialize and you can build up an expertise in a particular area that nobody else has. The object was to get the trademark placed on things that people would use. So within the soda fountain business, you created things like serving trays, tip trays, calendars, and posters—things that you would actually use in the business. They could serve anything on a tray that had a Coca-Cola trademark on it. It could be coffee or it could be tea. Either way, right in front of you would be this image of a pretty woman drinking a Coca-Cola. So maybe next time that you’re ordering something, you’d order a Coke. The marketers were tremendously creative in producing things that you’d carry on your person, things like wallets, purses, cufflinks, pocket mirrors for the ladies, bookmarks, stamp holders, and notebooks. Let’s say your wallet has a Coca-Cola emblem on it. Well, every time you pull out that wallet to pay a bill, it was a reminder to try a Coca-Cola. Or say you had a lady’s pocket mirror. Every time you adjusted your make-up, you’d get that reminder as well. All of these items had a very utilitarian element—they were things that you used every day in the course of living your daily life. Yet each was an invitation for you to try a glass or a bottle of Coca-Cola. People need to have a pen or a pencil, so they might as well have one that has a trademark on it that will invite them to try this product sometime. The idea was to come up with innovative ways to connect with consumers. It worked, and so a lot of these things have now become really desirable collectibles. Certainly we never produced them with that in mind, but Coke used the best artists to create its images and its goods were high-quality. In the beginning, Coca-Cola was a brand that nobody knew anything about. It was a flavor profile that was not known at the time. 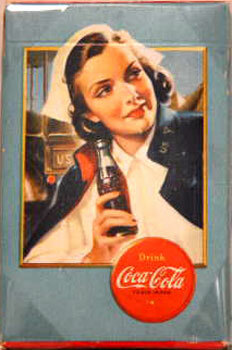 Most drinks before Coca-Cola were fruit-flavored drinks—oranges, grapes, strawberries, raspberries—and root beers. Along comes this new cola product. They had to find ways to get people to taste it, to increase sampling. One of the ways to do that was to produce advertising materials that would encourage you to try this new product the next time you’re at a soda fountain. We were actually the first company to use sampling coupons. They would have these salesmen go out on street corners and hand out coupons entitling you to a free drink of Coke at the soda fountain. And so people would redeem it at the soda fountain, try the new product. Well, now those sampling coupons are highly prized collectibles. Another early advertising form was the clock. They would give clocks to pharmacies that sold Coca-Cola. They would give away apothecary scales, things that the pharmacist would use every single day. Again, there would be an ad for Coke on the scales. They also gave away ceramic syrup urns, which were highly decorative, but fully functional, pieces. These things were designed to sit on the front of the soda fountain itself, so they were very visible. I like the turn-of-the-century Coca-Cola antiques. They have that wonderful Victorian quality to them. The very ornate trays with those fashionably dressed women on them immediately take you back to that period in our history. I also like the advertising that we did in the 1920s. If you read history and literature, you probably already have a picture in your mind of what people looked like in the 1920s. Well, advertisements for Coke in the 1920s capture all of that perfectly. 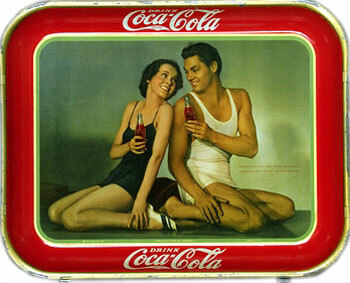 If you want to know what a flapper looked like, just take a look at a Coca-Cola tray. Coca-Cola advertising from that period captured the lifestyle perfectly. It’s almost like a photographic record. Up until the 1920s, there was no home refrigeration. When home refrigeration started to become more common, we introduced a six-pack carton. So, instead of buying Coke one at a time, you could bring home a six-pack and put it in your refrigerator to enjoy at your convenience. People didn’t have to walk down to the corner store to get an ice-cold Coke anymore. When you get into the 1960s, all of a sudden Americans are more mobile. They want packaging that can travel with them, and so you see the introduction of things like cans and no-deposit, no-return packages. They’re going on picnics, they’re going on family outings, and they want to bring Coke with them. So you have to give it to them in a package that’s going to work in those kinds of situations. Up until 1960, we only had one product and that was Coca-Cola. But people started to say, “Gee, we need to have a diet drink,” so we introduced Tab. Diet Coke came later, followed, more recently, by Coke Zero. It’s all about responding to what consumers are telling us about their lifestyles. You have to adapt as you find out that consumer patterns are changing. That’s the trick. You have to be able to change, adapt, and go wherever your consumers are. We were into Canada, Mexico, Cuba, and Panama fairly early in our history. The first serious expansion was probably in the mid-1920s. By about 1930 we had operations in Western Europe, South America, and a little bit in Asia. We were in China as early as 1927. But it was really in the post-World War II era that we became a global company. Having American GIs moving around the world and introducing local people to Coca-Cola really helped. In fact, we sent 64 portable bottling plants with American troops during World War II so that they could still get a Coke while they were away from home. For many GIs, that was a strong reminder of home. That’s how Coke and GIs became so closely linked. In late 1960s, early 1970s, we started to see a boom in collectibles. Maybe it was because during the 1960s there had been a lot of social upheaval in the United States, so perhaps these images of a simpler time appealed to people in a special way. That was also the period when we started to see the emergence of clubs that were formed just to collect Coca-Cola memorabilia. 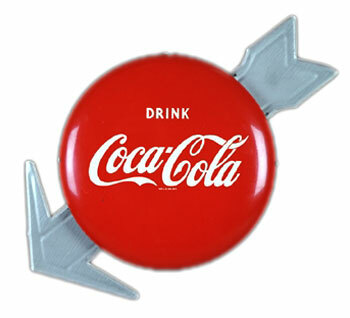 There are two categories: vintage Coca-Cola collectibles and more recent items. The vintage pieces are difficult for young collectors and new collectors on a budget because they tend to be pricey. It’s a lot easier to get into collecting bottles or cans or pins because they tend not to be expensive. You can develop a pretty nice collection without spending a lot of money. The vintage stuff is out there, but it’s not cheap. We see pieces every time we go to one of these collectibles meetings. There’s always an auction, and it’s almost always vintage stuff that’s being sold. People are comfortable with Coca-Cola memorabilia. It brings back memories. It may remind them of a simpler time in our history. There are all-American girls on the trays and calendars, suggesting a more innocent age, if you will. That’s kind of the appeal of the product: Coke is a brand that people associate with happy times—a birthday, a football game, the prom, graduation. It’s a product that people have around when they are with friends and family. I think that that’s what makes Coke so comfortable for people. It’s like an old friend. So if you collect this stuff and you put it in your rec room or you put it in your living room, every time you walk into that room, you probably smile a little bit because it seems like you’re rekindling something that you once had as a part of your life. The thing I’ve learned is nobody can collect it all. There’s just way too much of it. The company produced these things in such quantity for such a long period of time… it really is staggering. I am totally convinced that there will never be anybody who’ll have the definitive collection of Coca-Cola memorabilia. I don’t think it can be done. And I think that that’s one of the things that impresses me the most. We’re a company that sells our products in 200 countries around the world. Wherever you go, if you’re on vacation or on a business trip, Coca-Cola is there. That adds a whole other collectible element. It might be a bottle, can, pin, or cool sign rendered in a Cyrillic alphabet or an Arabic script—maybe you can’t read the words but you know it says Coca-Cola because of the way it appears on the object. The script has pretty much been unchanged since 1886. It was designed by Frank Robinson, who was the bookkeeper of John Pemberton, who invented the product. Because he was a bookkeeper, Robinson had this flowing handwriting, Basically the Coca-Cola logo is Mr. Robinson’s signature. The look of the script has been mostly consistent, but the elements we put around the script have changed a lot. Currently, for example, the words Coca-Cola are placed within a square. In previous years, we’ve put it in a circle or we’ve put it in a rectangle. We’ve put it in what they call a fishtail. So the script has been used in a number of configurations and has had different sizes and shapes, but the script itself is relatively unchanged. An artist named Haddon Sundblom did the Coca-Cola Santa Clauses for years and years. People love it. The Santa Clauses that were created back in the 1930s are still used in our advertising and packaging in the 21st century. Sundblom captured the spirit of the holidays so well. If you’ve got one of the original ads or a poster with one of the Santa Clauses on them, that’s a pretty cool collectible. We began creating Santa Claus imagery in 1931, and Sundblom did all of it through 1964. So for more than three decades, we had one artist working on creating an image of what Santa Claus ought to be. Today his Coca-Cola Santa Clauses are part of our collective DNA. The drink was first served on May 8, 1886. Two weeks later, we had our first ad in an Atlanta newspaper. So advertising was a very early part of our history. 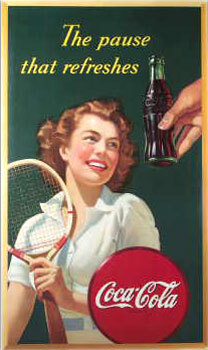 Advertising was always one of the key things that helped to make Coke a successful product. For the first 13 years, Coca-Cola was only available at the soda fountain. It wasn’t until 1899 that we started bottling it. So there were 13 years when the soda fountain was the only place you could get a Coke. In fact, it wasn’t until the late 1920s before bottling overtook the fountain business in terms of the number of gallons that we served to consumers. The biggest change in advertising, obviously, is that today so much of it is electronic. It’s radio, television, the Internet, and websites. That’s probably another reason why the collectibles arena is so strong for Coca-Cola—we’re simply not doing the same kind of advertising. We don’t produce trays, calendars, posters, and print ads in the same way that we did even back in the 1950s. That era is behind us. We do very little print today because that’s not how consumers get their information. Billboards are still relevant. People are still in their cars, and they’re kind of a captive audience. So yes, we do billboards, and we do what are called “spectaculars” in places like Times Square or Piccadilly Circus, where millions of people will see it every day. The calendars are where the artists really go to do their magic. For instance, Norman Rockwell did three calendars for us. N.C. Wyeth, Andrew Wyeth’s father, did several calendars for us. And then the other calendars were done by illustrators who were very well-known back in the 1920s and 1930s. If you can find a calendar that still has its scratch pad, well, that’s like one of those things you’d find in a time capsule. In addition to Rockwell and Wyeth, Haddon Sundblom, who did the Santa Clauses, also did calendars. Other artists included Fred Meissen, Bradshaw Crandall, and Gil Elvgren. These were all really well-known illustrators. They’re not terribly well-known in the general community because until recently, illustrators had not been considered, by some, to be true artists. They didn’t get the recognition of people like Rockwell. Most of the work was commissioned through the ad agency that we were working with. For the bulk of this period, about 50 years, we used an agency called the D’Arcy out of St. Louis, Missouri. They would be the ones who would contract with the artist to produce a piece of art that would then be used to create a poster, calendar, magazine ad and the like. At one point, somebody created a sandwich press that had a Coca-Cola logo on it. It was sort of like a Panini press today for sandwiches, but this one put a Coca-Cola logo on the bread. That was unusual. There were a couple of hatchets that were produced. They had logos on them. Why they did it, I have no idea, but somebody apparently decided that would be a cool idea to advertise on an axe or a hatchet. So I guess when somebody went to chop a tree down, if you got thirsty, you would go and buy a Coke. They had little dishes that were created with our logo on them. There were things like flyswatters that had the logo. There were knives and forks and spoons that had the logo. Cufflinks and cow bells, wash gloves and thimbles, just about anything you can think of. If you create a poster or a calendar in the United States, it might work well here, but if you take it outside the United States, the people in the poster or calendar may not look like natives of that country. So you might have to take out the Caucasian person and substitute an Asian person in order to make it relevant for a different market. Or perhaps it’s the background: if there’s an American suburban home in the background, that might not feel relevant in other parts of the world. So they might take the basic idea that was in the ad and change the elements so that it looks like it belongs in a given country, like using the right cars and that sort of thing. So, yes, you definitely have to make adaptations to make the advertising relevant, but you can use pretty much the same techniques. People around the world celebrate all sorts of things. There was a bottle that we did this year in London for a particular store. It’s a pure yellow bottle because, apparently, yellow is a meaningful color to the store. It’s not a color that we typically will use on a bottle, so that was somewhat unusual for us. In other parts of the world, we’ve commissioned designers to come up with special bottles. Bottle collectors love that. So you see that kind of thing. That’s what makes a lot of the foreign bottles so collectible; the chance to get something that we don’t see in the States. It’s not just people in the U.S. who appreciate all this stuff. There are strong pockets of Coca-Cola collectors in Belgium, Germany, France, and Italy, with smaller—but equally enthusiastic—groups in Japan and Spain. The biggest change that I’ve noticed is a movement on the part of young people away from vintage collectibles. They are just not that available, and if they are, the pieces are so expensive that they can’t afford to participate. The trend is toward what I call the secondary collectible categories, things like bottles, cans, pins, and small collectibles. Even some of the licensing items are prized because they’re more affordable, and you can make a cool display with a relatively small investment. I’d say that’s the biggest trend that I have seen. In fact, there are now really two classes of collectors—those who focus on the vintage material and those who are interested in the new stuff. Truth told, the vintage people aren’t really excited to be at the same convention or show with all these bottles-and-cans collectors. They tend not to hang with those people a whole lot. A lot of my entries deal with collectibles in one form or another. I made several posts about the 2009 convention in Denver, to give people who can’t go to a national convention a chance to see what actually takes place there. The feedback I get is pretty positive, but it’s hard to know exactly who’s going to it and who’s looking at it. I get a lot of comments like “I have this or that piece. What’s it worth?” It’s tough when everybody wants an individual appraisal. Sometimes I just don’t have the time to answer all of those questions. I really have to draw a very strict line here: I don’t collect Coke materials, and anybody who works with me can’t collect Coke materials either, because you inevitably come into a conflict of interest at some point. That’s just a rule. I get to have my own collection here at the company. It belongs to the company, but I treat it like it’s my own. I gravitate to the earlier material for several reasons. First, it’s really rare and difficult to find. Second, in a lot of those early pieces, they were using German and Czech lithographers, so you get a quality in the item that you can’t get anymore. That’s a skill that has been lost, unfortunately. In terms of a single category of item that I especially like, I guess it would be a piece of advertising called a festoon. There were usually four or five pieces to it and they were typically installed on the back bar of a soda fountain. The centerpiece was usually a very pretty woman drinking a glass of Coke, with a lot of floral designs going off to the left and right. 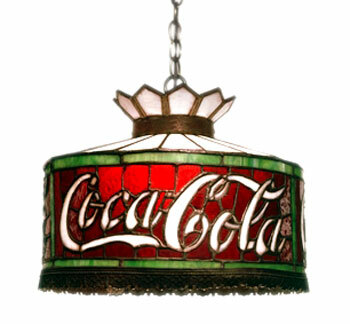 Festoons were extremely attractive, very colorful, and are among the rarest pieces of Coca-Cola advertising you can find. Festoons were delivered to soda fountains on a quarterly basis to cover each of the seasons. Most soda fountains simply threw them away after a season was over and a new one arrived. They’d toss out the old one and put the new one up, which makes it tough for collectors today to find a complete unit or set. Those that are still circulating often have a lot of damage. In terms of rare items, the rarest are the early trays and calendars simply because there weren’t that many of them produced. 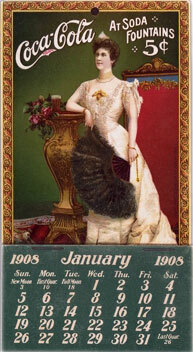 Our first calendar was produced in 1891. I’ve only seen three or four of them, either in our official collection or in private collections. Same is true with the early trays. You just don’t see that many of them. Whether they’ve just been lost to time or there weren’t that many produced to begin with, I’m not sure. But when they come up at auction, they tend to go for big dollars. Coca-Cola collecting is a very democratic hobby. People who collect Coke stuff are professional people—doctors, lawyers—as well as average blue-collar workers who are very middle class. Except for the vintage pieces, you don’t need a lot of money to participate. If you want to have some fun and make it into a bit of a treasure hunt, there’s a place for you. A good way to get started is to attend a convention. There’s an organization called the Coca-Cola Collectors Club, and once a year they have a national convention. This year (2009) it was in Denver. Next year it’ll be in Milwaukee. There’s a silent auction; there’s a regular auction. There’s a swap meet. There are seminars for people to learn about various aspects of collecting Coca-Cola material. There are social events that the various chapters run. But probably the single most interesting thing that they have at a convention is what they call room-hopping, which is basically where a hotel bedroom ends up being a selling room. People just leave their doors open and you go up and down the halls and into people’s rooms. All over the beds and the walls and the bathroom are things that they have either for sale or for swap. You can spend hours just wandering the hotel doing that. It runs for the better part of a week. Conventions are about more than just buying and selling, though. For instance, in Denver, there was a seminar with a paper conservator, who talked to us about how to preserve paper materials. Lots of collectors make terrible mistakes with their paper collectibles. For example, if you put a piece in a brightly lit room, then you’re exposing your paper item to ultraviolet rays. Guess what? The color is going to fade in no time flat. Or if you store stuff in your attic or basement where there’s significant temperature change, it’s likely that you’re going to do some damage due to the expanding and contracting of the paper as the temperature goes up and down. A lot of people, even seasoned collectors, don’t necessarily know that. In addition to the big one, there are regional meets during the rest of the year. So if you can’t make it to the national, then there will likely be a regional meet somewhere in your geographic area. The standard book on collectibles is by Allan Petretti, called The Coca-Cola Collectibles Price Guide. The last version was published in 2008. It’s a very extensive book that covers all the categories of collectibles. I would certainly recommend that people start there, with the understanding that it is a price guide, not a price bible. Just because he says something doesn’t necessarily mean that that’s what something is going to sell for. But it will give you a sense of rarity. eBay is a fantastic place to gauge the market. Every day there are thousands of Coke items up for auction. You can get a real education by looking at what all that stuff is actually selling for. But there’s nothing that beats going to an antique show, flea market, or club gatherings where you can talk to people and learn from them and get a better understanding of what’s high-priced, what’s low-priced, and what can you expect if you decide to collect in a specific category. There are a lot of people out there who have been collecting Coca-Cola for years, and most of them are pretty willing to share their knowledge with new people. Everyone’s just trying to advance the hobby. I am doing a project for school and need some help. Part of my research has to include an expert and since Coca-Cola won’t answer the questions not sure where to try. Here are my questions if anyone can help. 1) Why was Coke invented? 2) Where does it originate? 3) Why is it called Coca-Cola 4) What is the secret ingredient 5) How do you make it? 6) Where was John Pemberton born? Thanks for any help anyone can provide. Just picked up a prototype sign made in Charlotte NC Only two made…one was given to the coca-cola co. the other I just purchased at an auction. The sign is a heavy plastic in very good condition no cracks and excellent color. Trying to figure out what year it was made. It also has the number “6555” in the bottom left hand corner. The border of the sign looks blue with yellow and red the other colors. Just trying find out any information possible. This site is just so great and useful. On the left upper corner, there is a “1933” written by hand. I have no idea what it is. my question. in 1975, world wide mint, produced silver ingots for coca-cola’s 75th anniversary. some say , one and only one solid gold ingot was produced and presented to mr mongomory. is this true? and was there a newspaper article written about it, that i could see and read? I love this site! How can I tell if a sign we just purchased is authentic or a reproduction? It’s a metal 24″ x 36″ “Enjoy Coca-Cola” sign with the dynamic swoosh underneath, and it seems to be in better condition than I would expect from an antique. Are there any tell-tale marks I should be looking for? There are no marks on the sign indicating the manufacturer. My mom has an 8 pak of unopened diet coke 16oz bottles that she acquired some years ago at an auction, and was about to open one when someone told her she should not until she got history on it. The bottles range from Dayton, OH to Bend, OR with two without areas on them. Could you provide or direct me to someone in the Richmond VA area who could elaborate on these because I do believe she is interested in weighing her options. I did not know where to start. Thank you. My husband and I found a coke bottle that is described below. It has the word Fox embossed 6 times around the top of the bottle. Around the middle of the bottle it reads Soda Water ( 2 times ) and below that it reads Property of Cocoa Cola Bottling Co Con 9 FL OZ. I have a Coke Rug. It says. Coke adds life to… everything nice. My Dad had bought it. I would like to send you a couple of pictures. There are symbol’s on the back and the number 96. I can not find it on the internet and was wondering if you could help tell me where it came from and also a price. Ohio, Atlanta,Denver?? Sometime late 80’s early 90′? Maybe 96 I have no Idea. The Hottest Thing at the Olympics? “ ” Did these companies ask Walt Whitman if they could use his name and image? Did he receive any money for it? No and no.